As you know, the chalky paints can be expensive and back when I was in college there was no such thing as ready made. We made our own, but often if painting wood surfaces we started with THIS STUFF. 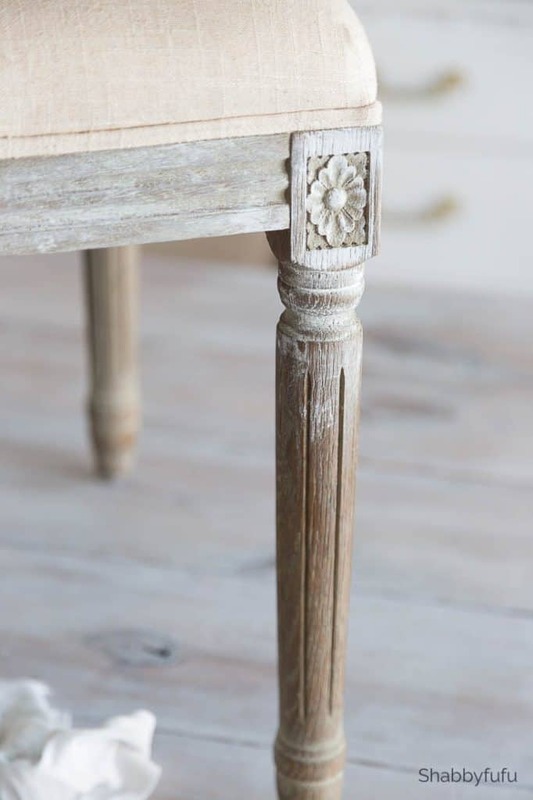 Amazing…I don’t know if I’ve seen other DIYers use it but if you’re looking for a soft distressed surface that is similar to LIMEWASH, this could be for you! Did you read the post where I used a cruddy old dropcloth to make a summer beach painting? Dead giveaway on what this amazing stuff called gesso is intended for. GESSO is made for painting on canvas and preps the canvas for paint will adhere to it. It’s a combination of binders, paint pigments and yes…it does contain calcium carbonate which is CHALK! You can find out more about gesso for artists in this article. A little bit goes a long way and at under $20 it will last you a really long time with this technique. 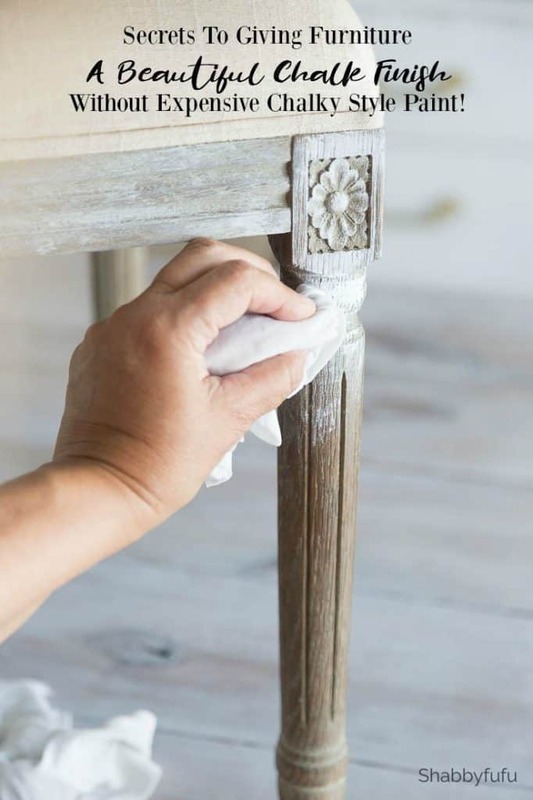 There is no need to prep your wood, similar to using the chalky paints in a can. Just clean off any dust with a rag if your piece has been sitting around awhile. Grab a waxed finish paper plate or a throwaway plastic food storage container and squirt a tablespoon or so out. I used a small brush on these chairs and since I wasn’t painting the upholstery I grabbed a 1″ angled brush. 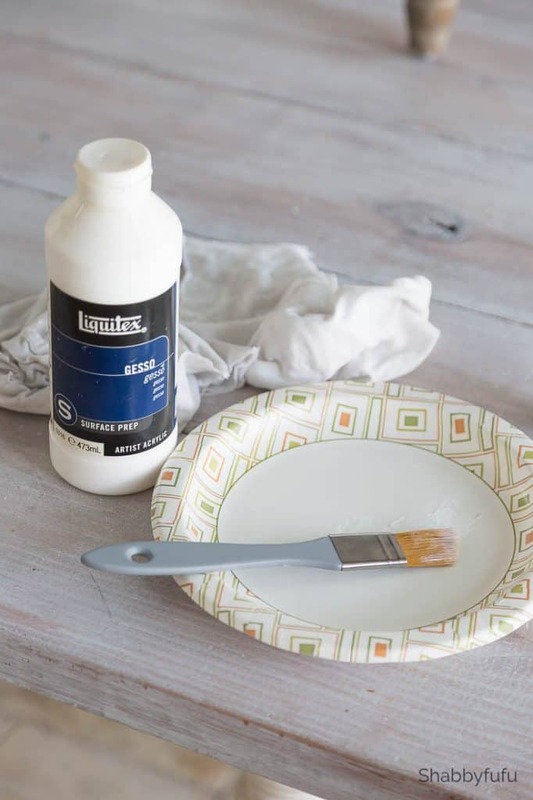 Use a dry brush painting technique similar to what I talked about in my post on WHITEWASHING A FARMHOUSE TABLE. What that means is don’t wet your brush. Grab the gesso on the tip of your brush and drag it in the direction of the grain. Have a wet rag on hand and wipe the gesso down if you’ve put too much paint on any areas. Once you start wiping down areas you will have some gesso on the rag, so keep that in mind. You’ll probably want to wet the rag again and squeeze out excess water out as you continue your painting. A reader asked me if you can tint gesso and I’m updating to say YES! Just mix in a small amount your favorite acrylic paint and try it out. Start with a small amount and add more if necessary. As with any project (or photo styling) I recommend stepping back and taking a look at your progress. It’s amazing how you think something might look and then you stand back and get a totally different feel! This wood was pretty porous. I wouldn’t recommend this particular process for anything with a lacquer or heavily glossed finish. If chalk painting those finishes you’d probably want to sand down and use a thicker paint like the real deal. It took me 1/2 hour per chair to paint these and only one coat required! They don’t need to be sealed since the gesso sinks in, but if you are using this on a tabletop or flat surface you can seal with THIS (my favorite furniture wax!) or THIS. I like the new lighter look. The gesso used on top of the wood gives it a French grey tone. 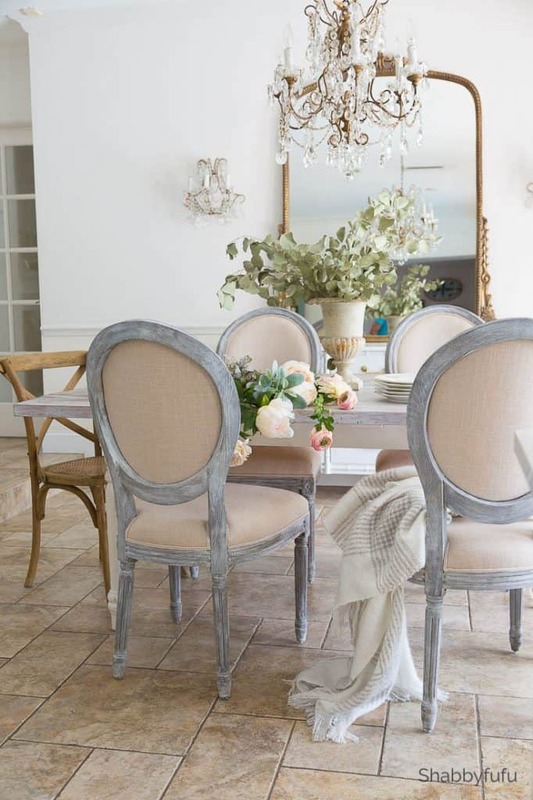 Perfect for my French country coastal modern crazy but it works home! Let me know if you have any questions on the chalk painting furniture technique (without chalky paint) in the comments and please share and pin for later! I would love to try this on a very old sideboard in my breakfast area. It still has an old golden oak finish but no gloss finish. I may get some gesso and try it on a discret place like the back. The piece has a small oval mirror and barley twist legs. It holds most of my flower vases and pictures of all the grand kids. I have been meaning to get to this project for years! Is it possible to tint the gesso? Good morning Deborah! Absolutely you can tint gesso and I just updated the post with your question to reflect the answer. Enjoy the process! It’s great that you share budget ideas with so many people struggling these days. I think that anyone can have a beautiful home on any budget. I’m so glad that you enjoy the tips! What a great idea! I have a clock case hanging on my living room wall that is wonderful, but the ugly mustardy color needs to be “taken down” just a bit. I didn’t want to paint it and wasn’t sure how to do it — but this seems like the perfect solution! Thank you Janet! That’s kind of what I wanted to do with my chairs, just tone them down. As always, do a test area first Patty and thanks for stopping by! This great and 8use gecko for aging pots. I ne er thought of doing this before. Thanks for the tip. It does work for just about any surface! Enjoy your day as well Cindy! You could use it on polished wood, much like chalk style paint. If I had to paint 10 chairs though I would use a sprayer which will make the job so much faster! Thanks… so I painted two chairs with chalk paint from Michaels but the finish is very rough and feels so dry to the touch. Do you recommend anything to make it more polished? I tried a wax finish also from Michaels but it didn’t help and made it more of a yellow color. What kind of sprayer would you recommend for the rest? This looks great Janet! I like the whitewashed look! Do you have any posts on whitewashing a rock or brick fireplace? I have an old rock one that is an eyesore in my living room and it’s too expensive to tear out and start over. I loved this tutorial on the furniture! Hi Jennifer! I don’t, but you can use diluted latex wall paint. I would experiment in a less noticeable area with it and start out only diluting slightly and add more water if needed. Wipe with a damp rag. Very similar to this technique! Love it, looks soft and vintage. I have been using Gesso for years finally graduated to real chalky paints. I wanted that look before chalky paint was on the market and being an artist I thought, why not. Like they say “ necessity is the mother of invention.” Sort of my motto. If I can’t find what I need I just make it. Great job.. Thanks for chiming in Debbie and good to know you’re familiar with the process! This looks beautiful. Did you use this technique on the dining table top in the final photo? Diane, within the article is a link to the dining table DIY. It’s a slightly different technique and waxed for protection. Thanks for stopping by! Hi Janet, I’ve been following you for quite a while on Home Style Saturdays. I love your teaching style, as well as your home style. I especially LOVE this post! I’ve been wanting to white wash or lime some pieces in my home … but the process has been a little intimidating. But “gesso” looks amazing. Thank You! Love it….a great DIY project that will make anyone feel confident that they can do it!! I’ve used your technique for years but with just regular white paint! I didnt’ think about using gesso but now I will!! Thank you for the idea and tutorial, Janet. 🙂 Funny, this week I’ve been painting a little nightstand cabinet with chalk paint ~ wanted to try chalk paints and see how they look. Enjoying painting again! Have a great rest of your week! Coming over from Style Showcase. Thank you Barbara…hope you have a great upcoming weekend and have fun with your projects! Do you think the Gesso technique would work on a metal chandelier? Thank you for stopping by Manelle! Yes, it should work on a chandelier as well. So, if I want to lighten a dark brown side table I can use this and it will be a creamy white? Where do you purchase gesso? The chairs are so pretty! Suzette, I would try it on an inconspicuous part of the table first and see your results. Every piece of furniture will be different! I have the gesso linked within the post. How do you think this would hold up on kitchen cabinets? I’ve got those ugly old oak cabinets from the early 90s that are screaming for a makeover. Tks! Hi Janet, Awesome! What a novel idea! I’m wondering what do you think about using it on a piano? I have a small Wurlitzer that is that orangey-red honey tone Popular in the 70s. The color just grates on my nerves, but I’m not up for a massive undertaking. It’s too big to move around more than a little bit away from the wall and protect the floors etc. but he can go outside or anywhere! I’ve been mulling over attempting to paint it but I’m so worried about the delicate nature of the instrument and getting so close to the keys etc. with something that might slop on. “Mommy broke the piano,” is not the excuse my son needs to have for not practicing! Your thoughts? ? Thanks, anxiously awaiting your thoughts! I think that if you move wood furniture outside you need a covered area and a fairly dry climate. We don’t have either of those here where I live so I haven’t really tried it. Your chairs are gorgeous! What material did you use to upholster the cushions/back? Thank you Jenni! They came this way and that’s one of the cool things about my painting method. 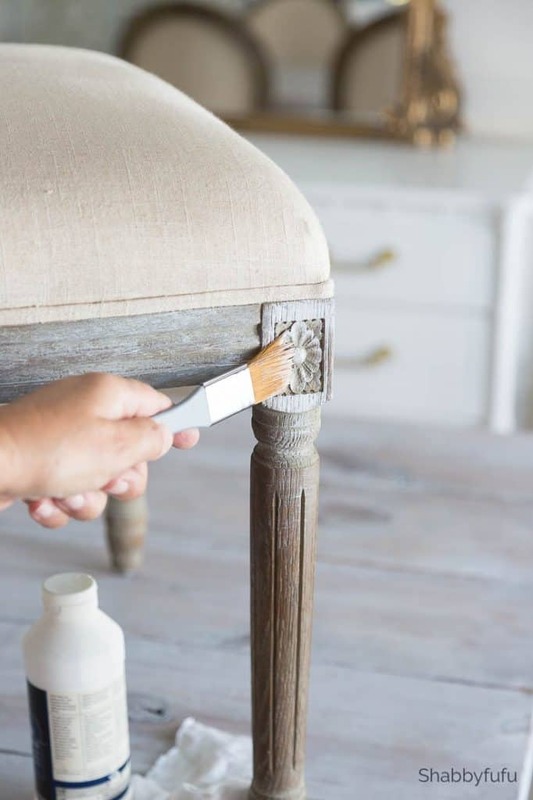 You can just use a small brush and no need to reupholster! I’ve used white gesso for whitewashing and dry brushing for years and you can’t beat the effects you can achieve. It gives more depth and a natural beauty to the piece. I love the way you did your chairs! They came out beautiful. I didn’t know you could do this with hesso and not have to topcoat. Your tutorial is perfect and I don’t know how it took me so long to find your blog! I’m enjoying reading through your old posts. Thank you for addressing gesso . So many painting bloggers ignore this wonderful product and the multiple uses it has. Hi Christie! It’s readers like you that truly make what I do worthwhile and I greatly appreciate you taking the time for such a thoughtful comment. I do love gesso and as a former art teacher I’ve used it for a variety of painting projects. I agree about the painting bloggers! Hi Janet, I just saw this post on Pinterest when I searched for easy chalk paint ideas (I enjoy trying new techniques). This sure nailed it for me!! I ordered the gesso and can’t wait to try it! I hope it will update my 20 year old bar stools. I’m happy to be among your followers! Hi Cecelia! I’m so happy to hear that you found me on Pinterest and are following the blog now! As a former art teacher I have used gesso for years for various projects. Have fun painting and reviving the barstools. Thank you Pamela…it’s easy and low cost! Thank you for letting me know Karen and I’m excited for your plan! I have used gesso for years but never in that application. 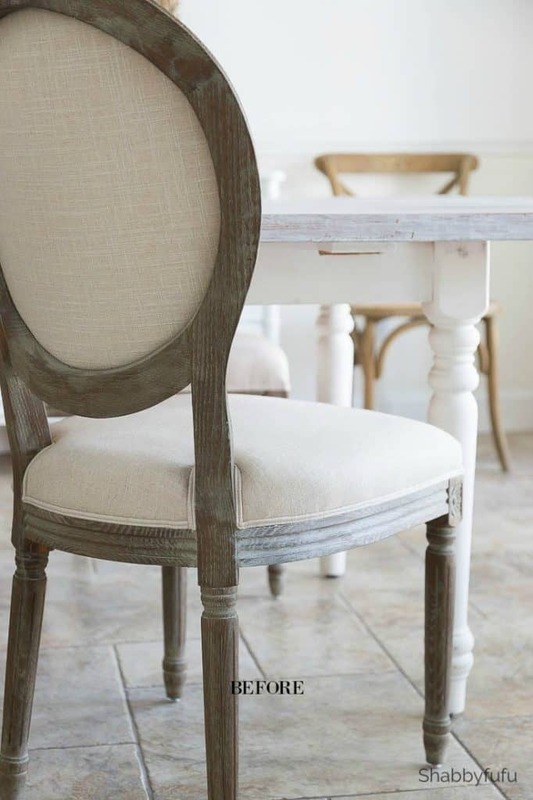 I love the ‘weathered grey’ look it gives to those chairs. The gesso really works well. I used it on a french settee before I had it reupholstered in white. Love the results! I would suggest a blush color for your bedside tables. The color is still neutral and adds warmth.